Why would a switch be wired with its neutral connected to ground? The wire at the bottom is the power source and the wire at the top goes up to the light/fan. Why would they pigtail the hot off the connected hot/neutral, and connect the neutral from the light/fan to the grounds? Should I just cap the incoming wire how it is and run a new wire for the switch and not even mess with it? The picture that you show indicates some very serious and dangerous wiring connections. This was clearly done by someone that had NO clue to proper wiring craft and codes. Since you have found similar issues in two spots it leaves to question about how much the rest of the abode is wired in similar careless and dangerous way. I would recommend that you bring in someone who knows all things related to mains wiring and codes and perform a 100% survey of all your electrical wiring including all boxes, panels, lights, switches and outlets. Without doing a rigorous job of this you will have no idea how much risk you are dealing with before someone or something gets electrocuted or seriously damaged. First I thought he was working around a broken wire. Except he did it twice. He just believes paralleling wires is a good idea. He's wrong. Each wire provides a separate function, and each is important. But paralleling is bad even if you had an extra wire, for other reasons. For each cable he surely did the same thing with both ends. So that means you need to follow those two cables upstream and downstream (to the lamp) and inspect there too. All this needs to be corrected. If the house is full of it, it'll be a lot of work. You can do it if you're willing to get a book at the library and school up on wiring basics. (don't learn too little and end up making it worse, that's what he did!). You can hire an electrician but it's big dollars for not terribly hard work. Since you can't fix the whole house at once, work with one cable at a time, and correct both ends of the same cable. If you can't clearly identify which cable is which, then do one circuit at a time, fix all its cables. You can tell what's on the same circuit because it lights up when the breaker is on, and turns off when the breaker is off. In the meantime, this is a serious wiring hazard for so many reasons. I would at the least get some GFCI + AFCI breakers until it is fixed. The lower cable was originally a switch drop, with one wire of the lower cable being permanent hot and the other being switched hot. This sort of thing should be marked with tape/sleeving but things that should be marked don't always actually get marked. At some point someone decided to change the switching arrangements, changing the previously switched connection to permanent on and adding a new switched light. So they connected the old permanent live and switched live together and connected them to one side of the new switch. They did not have a Neutral available at the box so they misused the Ground as a Neutral. Another possibility as someone mentioned in the comments to another answer is that it was originally a bodged 3 way switching set-up and one of the switches was later removed. Misuing the ground as a Neutral is bad for several reasons. If the ground becomes disconnected the load will drag it up to mains voltage. The ground wire may not be rated to carry regular operating currents. It is only intended to carry fault and leakage currents. Volt drop will cause small voltages to appear between different grounded items. While the voltage is low the potential currents are very high and can burn out things like signal wiring. When you find crap like this, especially when you have found it more than once in the same installation IMO you really need to treat the entire installation as suspect. You really need to trace and map every wire so that you can check that the installation as a whole is sane. On the plus side it at least looks like you have sheathed cables rather than single wires in conduit. That will likely make things easier to trace out. Thanks everyone for all the input. I figured this out tonight, and it was as i suspected: a lazy half-hot outlet rewire. This outlet has the tab broken, so it was originally a half-hot. I have actually rewired a room that was still half-hot in order to install a ceiling fan. 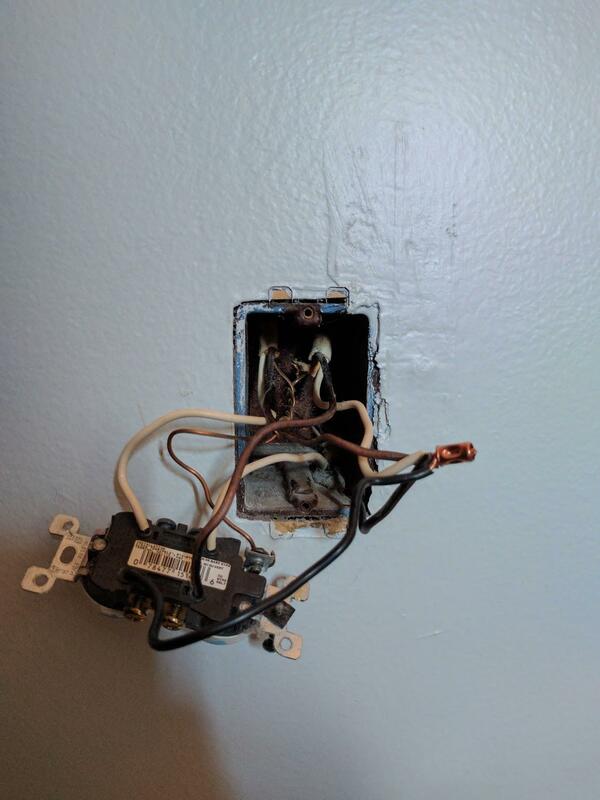 Only when I rewired it, I put in a new duplex switch, and connected the neutrals back together so the line to the switch could be used to connect to a new line to the ceiling fan. This bozo decided to not rewire anything at the outlet and instead capped and pigtailed the hot/neutral-acting-hot together as the power input to the switch, and ran the neutral/ground from the fan back down the ground wire. All they really needed to do was move the neutral in the outlet box off the hot pigtails and onto a neutral pigtail (like I had previously done in another room), but for some reason they were either too lazy/didn't know what they were doing/thought running neutral to ground was OK. There's no way the wires at the bottom would be your power source. If it was, your hot and neutral are nutted together. That would cause an immediate trip of your circuit breaker. So I suspect the top wire is the power source. It's obvious the ground is being improperly used as a neutral (this is a major shock risk the way it's wired). My bet is if you open the fan you'll find that the light and fan each use a wire. Someone probably had a double switch at one point and did it this way to avoid running 3-line wire. Assuming you've got the fan and light on separate wires you can actually fix this easily. Disconnect the ground from the fixture's neutral and the neutral in the picture. 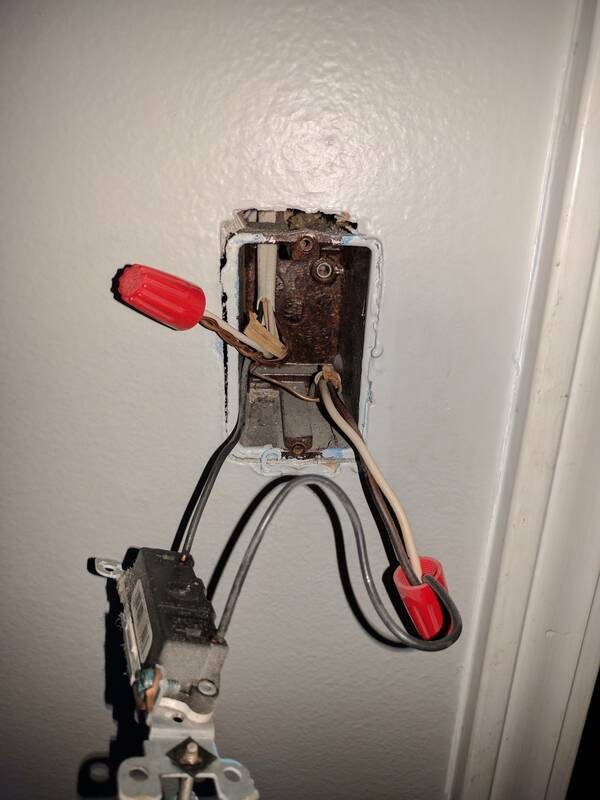 How can I install Z-Wave switches in these different situations? Why is my light connected between two red wires on a circuit with two switches? Why is neutral wired to ground at this switch? Hot disconnected/ Neutral still connected OK?